FUNDRAISER – Are you a SCHOOL , P & F, SPORTING CLUB or NOT FOR PROFIT GROUP and looking for an awesome way to raise some funds? 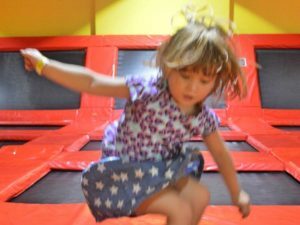 Why not host your next fundraiser at THE BIG BOING INDOOR TRAMPOLINE PARK! We do all the work and receive a rebate per jumper for your group. The more people the more money you receive. Speak to our staff about it. Save by Booking online, as there is a credit card surcharge paying at reception. Booking online is highly recommended especially on weekends and holidays, as peak periods will sell out. Book ONLINE here. Phone bookings can be made, but you must pay on the phone for the booking, unless you are paying by cash. Sessions times: Each session start on the hour from 9am. Arrive early sessions start promptly on the hour. Recommend 15 mins during peak periods. Cost $18 for general jumping over 110cms and $11 for junior jumper under 110cms. Plus $4 for grip socks. All jumpers need grip socks. Ninja Course (must be 140cm tall & must have enclosed shoes) is an additional $8, if paid for general jumping for the same hour. If only the Ninja course, it is $17 for hour. General Jumping is for everyone over 110cm tall. Toddler area is dedicated to children under 110cm tall. Ninja Course is for everyone over 140cm tall. It costs an additional $8 to the general jumping for the hour or $17 for the hour just Ninja. Bring sports shoes with grip for Ninja course. You can’t go on course without them! No outside catering permitted. Visit our café for snacks, meals and drinks. All children under 13 years must be supervised by an adult. The Big Boing is a large indoor trampoline park that’s all about jumping, flipping, fitness – and most importantly, landing soft and safely! 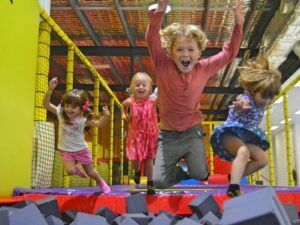 What to do on a rainy day on the Sunshine Coast, come to the the Big Boing!! Fun for the whole family from 1 1/2 years. 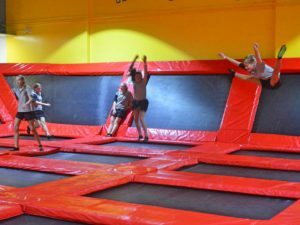 There is dodgeball, free jumping with 40 interconnecting trampolines, huge air bag to land in, slam dunking basketball, soccer, dedicated toddlers area with own foam pit and another area just for under 140cm tall. FREE WIFI and FULLY AIRCONDITIONED for those extra warm days! The Big Boing has a cafe to buy all your drinks and food while visiting. The Big Boing does not allow self-catering except for personal water bottles. The Big Boing does have a cafe which provides hot and cold refreshments. No Self-catering including personal birthday parties (not booked with The Big Boing) including birthday cake is not permitted. There is a park across the road, if you wish to have a cake, if party is not booked with The Big Boing. Work Health & Safety does not allow us to give knives out to customers or customers are not allowed to bring knives onto the premises. A staff member must be in attendance at all times when a knife is being used on the premises. We hope you understand and your co-operation on this is very much appreciated. Bookings are on the hour from 9am every day. Please arrive 15 minutes before your booking time to check-in. That way you’ll be jumping on time! Book ONLINE here. A massive free jumping area, a slam dunk area, dodgeball court, giant airbag, toddlers area with foam pit. The Big Boing is the perfect venue for your next birthday party, family occasion, or even work or club event. The Big Boing caters for kids of all ages, whatever their fitness and skill level. And with a creche and group fitness classes, we haven’t forgotten parents either. It’s important for Big Boing participants to follow set rules, safety guidelines and to jump within their own ability. We want all our jumpers to make the most of our facilities, but also to leave happy and in one piece!